The price shown is one half down to get your Phono Preamp on order. 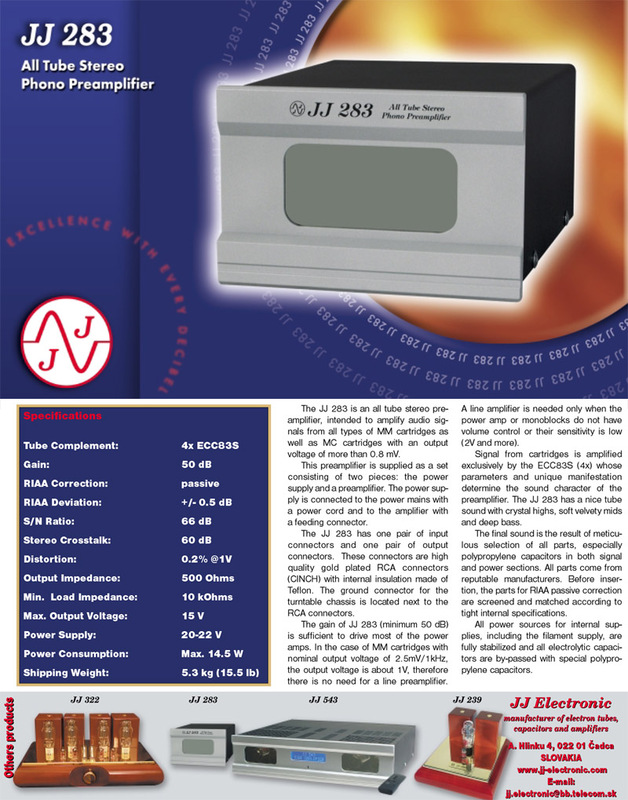 The JJ 283 is a dedicated phono preamp designed to accompany their 543 multi-channel integrated power amp. The 283 phono pre utilizes several key features starting with an external power supply. This keeps the signal to noise ratio at 68db or better. The preamp is built around four ECC83S's which achieve a gain of 50db per channel. This makes the 283 ideal for all MM cartridges as well as MC carts with an output of 0.8mV or higher. Each channel features switchable input impedance and capacitance loading. This is user selectable by removing the top panel and adjusting the dip switch toggles. Overall the JJ 283 has a fantastic sound providing excellent clarity and top end shimmer without losing the classic tube warmth we all love. Combined with the input configuration options the 283 stands on its own in its price range. You can choose the finish you would like by clicking on the "Customize” button. ***Deposit info: At this time all HIFI Preamps are sold on a custom order basis. The price shown in your cart is the deposit. Once we receive your deposit we will contact you to confirm the lead time and your choice of finishes. Lead Time: Average 4-8 weeks. Shipping: These Preamps weigh about 16 Lbs! We typically ship them by FedEx 3 day service however we will contact you so can choose how you would like it shipped. Topology: Stand-alone Phono Preamp with selectable input loading. Output: 1V@0.2% distortion (with 2.5mV input), 15V output max. 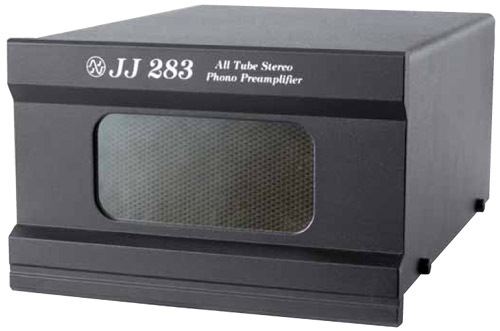 The JJ 283 Phono Preamp is designed to be used in conjunction with the JJ 543 stereo integrated amp. However it's equally suited as a standalone phono stage preamp for most power amp applications. With a 2.5mV output cartridge the JJ 543 will provide a 1V output (@0.2%THD) which makes it well suited for medium output MC carts or where high sensitivity power amp inputs are available. The input impedance and capacitance loading is user selectable. Multiple combinations are available which makes dialing in a wide range of setups a breeze. The preamp features a custom built chassis, external power supply and high quality components throughout including an array of capacitors built and spec'd by JJ Electronic.